Leukemia basics: Brief overview of leukemia, definitions, concepts (see below). Classification tools: Tools used for identifying different types of leukemia and lymphoid leukemia or lymphoma from non-neoplastic increases in lymphoid cells. Types of leukemia: More information on the three main categories of leukemia (acute, chronic, or secondary to lymphoma, which we call a leukemic phase of lymphoma). Acute myeloid leukemia: Much more information (likely than you ever want to know) on this neoplasm. Differentiating leukemias: A quick summary of the tools we use to determine the type of leukemia when it consists of “big blue” cells, i.e. acute myeloid leukemia, acute lymphoid leukemia and stage V lymphoma (leukemic phase of lymphoma). Acute leukemia: This can be of myeloid or lymphoid origin and usually originates in the bone marrow. Acute indicates that the involved cell type cannot be identified conclusively by morphologic features, i.e. they resemble (in most instances), a “blast” (medium to large round blue cell). Special diagnostic techniques, including cytochemical staining and immunophenotyping (immunocytochemistry, flow cytometry) are required to help determine cell lineage. Chronic leukemia: This can be of myeloid or lymphoid origin. Chronic indicates that the involved cell type is a differentiated cell, that in most cases, can be identified as to cell type, e.g. lymphocyte, neutrophil. Of the chronic leukemias, chronic lymphocytic leukemia (CLL) is the most frequently seen type. Leukemic phase of lymphoma: Lymphoma is a neoplasm of lymphocytes that originates outside of the bone marrow (extramedullary). Just as normal lymphocytes recirculate, so can neoplastic lymphocytes, resulting in a leukemic phase of lymphoma or leukemia secondary to lymphoma (some also call this lymphoma with circulating cells). Neoplastic cells can also infiltrate the bone marrow, mimicking an acute leukemia in some cases. The neoplastic cells resemble their counterpart in tissues, i.e. they will be small cells in a small cell lymphoma and large cells in a large cell lymphoma. The reason why we distinguish this specific type of leukemia (associated with lymphoma) is because of prognosis…the prognosis is generally far better with a primary lymphoma than a primary acute leukemia. Hematopoietic: Any cell arising in the bone marrow via hematopoiesis. This includes all myeloid or non-lymphoid (granulocytes, monocytes, megakaryocytes, erythrocytes) and lymphoid (B, T, natural killer) cells. Myeloid: The prefix myelo- in this context refers to marrow, not spinal cord. Myelo- or myeloid can carry a connotation that includes all non-lymphoid marrow cells (arising from the common myeloid progenitor), including granulocytes (neutrophils, eosinophils, basophils), monocytes, megakaryocytes and erythrocytes or can refer more specifically to granulocytes, e.g. myeloblasts, myelocytes, depending on the context. Lymphoma: Synonyms are malignant lymphoma and lymphosarcoma. Lymphoma is a neoplastic proliferation of lymphoid cells, other than plasma cells, that arises in extramedullary tissue (i.e. outside the bone marrow). Leukemia: Used without modifiers, this term carries a very general connotation of hematopoietic neoplasia arising in the bone marrow or the presence in blood of neoplastic cells of hematopoietic origin. Acute is a modifier indicating that the neoplastic population is an immature cell of myeloid or lymphoid lineage, which usually has morphologic features of “blasts”. Blasts are cells with round nuclei, fine chromatin, and a small amount of blue cytoplasm. They may or may not have nucleoli (i.e. a nucleolus does not define a cell as a blast). Because acute leukemias consist of immature cells, we cannot be sure of their cell lineage (origin) by their appearance (in contrast to chronic leukemias) – they could be myeloid, lymphoid, undifferentiated or mixed phenotype. Thus, in leukemia, the term acute applies to the stage of differentiation of the involved cell rather than the more usual usage of this term for duration of disease. However, in reality, acute leukemias present acutely and are rapidly fatal, so the term acute for a leukemia also implies disease duration (and progression). Acute leukemias also (in most cases) arise in the marrow. By definition of the World Health Organization (WHO), an acute leukemia requires the presence of >20% blasts for acute myeloid leukemia (AML) and >25% blasts for acute lymphoid leukemia (ALL). The defining blast percentage for AML, but not ALL, has been adopted by veterinary medicine. 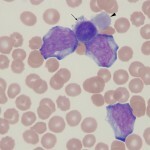 Acute myeloid is a modifier indicating that the acute leukemia is of myeloid (granulocytic, monocytic, megakaryocytic or erythroid) origin. This can only be determined by special procedures, i.e. immunophenotyping and cytochemistry, and not by the morphologic features of the cells. Acute lymphoid is a modifier indicating that the acute leukemia is of lymphoid (T, B, or natural killer cell) origin. Similar to AML, ALL can only be diagnosed after immunophenotyping cells. Acute undifferentiated (AUL) is a modifier indicating that the neoplastic blasts do not stain with any lineage-specific markers. Acute mixed phenotype (AMPL) is a modifier indicating that the neoplastic cells express markers of more than 1 lineage (i.e. lymphoid and myeloid). Chronic is a modifier indicating that the neoplastic population consist of differentiated (“mature”) cells of the involved lineage and, in contrast to acute leukemia, can be readily identified based on their morphologic features alone in blood smears and bone marrow aspirates. In general, chronic leukemias are indolent diseases that have a prolonged natural course. Just like acute leukemia, chronic leukemias can be of myeloid (any non-lymphoid hematopoietic lineage) or lymphoid in origin. Leukemic phase of lymphoma is used when neoplastic cells derived from a primary extramedullary lymphoma are seen in the circulation or bone marrow. This is compatible with stage V disease. Note that neoplastic lymphoid cells from a lymphoma can be seen in blood but this does not necessarily mean that the bone marrow is concurrently infiltrated by neoplastic lymphoma cells. Myelodysplastic syndrome (MDS) or primary myelodysplasia: This is a specific term that applies to a clonal (neoplastic) disorder originating in the hematopoietic stem cell that results in peripheral cytopenias (of one or more lineages) with a usually hyperplastic (ineffective) marrow and morphologic evidence of abnormal maturation. MDS differs from an acute leukemia by the percentage of blasts in blood and bone marrow (<20%). MDS can progress to an acute leukemia (called “preleukemic”) but many animals will die of their cytopenias before they develop an overt leukemia. Dysmyelopoiesis/dysplasia is a general term applying to the presence of abnormal features in hematopoietic cells of myeloid (non-lymphoid) origin, including erythroid cells, megakaryocytes and granulocytes. This is usually due to abnormal maturation of cells in the bone marrow and can be seen in clonal or neoplastic disorders (e.g. AML, MDS) or non-neoplastic disorders, i.e. secondary to drug therapy (e.g. chemotherapeutic drugs), inherited disorders (e.g. macrocytosis in Poodles), vitamin and mineral deficiencies (e.g. folate and vitamin B12) and any condition resulting in a markedly hyperplastic marrow (e.g. immune-mediated hematologic disorders, presumably secondary to “relative” mineral/vitamin deficiencies). Lymphoproliferative disorders (diseases): This is a very broad term that is used in the veterinary literature to include both neoplastic and hyperplastic increases in lymphoid cells. In many instances, this term is used in cases in which it is not clear whether the lymphoid proliferation is neoplastic or hyperplastic (i.e when we are not sure what is going on). The WHO uses the term exclusively for neoplastic disorders of lymphocytes. Myeloproliferative disorders (diseases): Another general term used commonly in the veterinary literature to encompass all forms of non-lymphoid hematopoietic neoplasia. These concepts are relevant to the pathogenesis of lymphoid and non-lymphoid hematopoietic neoplasia. Myeloid neoplasia: The syndromes of myeloid (non-lymphoid) hematopoietic neoplasia, though variable in their manifestion and clinical course, are all clonal diseases that arise from neoplastic transformation of a hematopoietic stem cell (HSC) (see figure). Somatic mutations in a HSC can result in an expanding clone of progeny that are not subject to normal regulation of cell death, proliferation and/or maturation. When the cells do not undergo normal cell death and accumulate, chronic leukemia is the expected result. If the cells proliferate, acute leukemia is usually the result. The proliferation occurs at the expense of normal hematopoiesis, leading to deficiencies of normal mature cells (which often manifests as cytopenias in peripheral blood). These cytopenias are a useful clue in differentiating acute leukemia (where they are an expected finding) and lymphoma (minimal or mild cytopenias are expected, since marrow infiltrates are usually not extensive and normal hematopoiesis continues to occur, despite any infiltrates). When the clone matures abnormally, myelodysplastic syndrome is the expected result, with associated cytopenias (from increased intramedullary cell death of the abnormal cells). 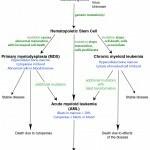 Thus, depending on the mutation or combination of mutations, the disease can be expressed as ineffective dysplastic hematopoiesis (the myelodysplastic syndromes or MDS in which there are too many hematopoietic cells with abnormal features), proliferation of immature precursors (the acute myeloid leukemias [AML]), or accumulation of differentiated cells (chronic myeloid leukemias). Both MDS and chronic myeloid leukemia can progress to AML. Lymphoid neoplasia: The syndromes of lymphoid neoplasia are also clonal and evolve from cells at any stage of lymphocyte ontogeny. The lymphomas are clonal proliferations of lymphocytes (T, B or natural killer cells) that arise in extramedullary tissue from anatomic compartments (e.g., follicle center, mantle zone, paracortical zone, etc.) of the lymph node or extranodal lymphoid tissue (spleen, liver, gastrointestinal tract, etc.). The cells of different lymphomas (large cell, small cell, mantle zone, marginal zone) share many features with their normal counterparts, which can influence the distribution, behavior, morphologic characteristics, and immunophenotypic profile of a given lymphoma population. However, lymphoma cells are rarely exact replicas of normal counterparts, i.e. they may express aberrant markers. The acute lymphoid/lymphoblastic leukemias usually arise in marrow from cells at the earliest stages of lymphoid maturation (precursor T or B cells) and can resemble blasts, although they can also mimic small or intermediate lymphocytes (and be misidentified as a chronic leukemia). In contrast, the chronic lymphoid leukemias arise in extramedullary tissue (particularly the spleen for T CLL and lymph node for B CLL) from cells at later stages of maturation, which are readily recognized as lymphocytes. The concept that lymphomas and lymphoid leukemia are clonal neoplasms has direct relevance to diagnosis. Recognition, either by morphologic features or immunophenotype, that the lymphoid cells in blood or an enlarged lymph node or other infiltrated tissue are of one type is a key part of the diagnosis of lymphoma or lymphoid leukemia. Indeed, we can now support that a lymphoid proliferation is clonal and likely neoplastic by PCR-based tests for clonal rearrangements in B and T cell receptors.